A few days ago I went to make a visit of condolence the wife of my manager who suddenly passed away. According of his story, it all happened so fast, his wife only complained of headaches and breathless, and a few hours later she passed away. I know this is a very hard for him and his children. Losing someone they love is a very sad thing, especially when occur abruptly. This verse spoke directly to my heart and makes me ponder. How far we apply this verse in our daily lives? How far we are able to believing it when we experience pain or suffering? David expresses it short but concise, and very clear. He said that whatever happens, he will never lack. Is it because of his strength, his prowess, ability and endurance? Not at all! David knew that his strength as a human being is very limited. At certain situations, as good as the human ability will no longer be able to do anything. David could say that he will not be lack because realizing the existence of God as a good shepherd of his life. No more and no less. Both in quiet and difficult times, David realized that God will always be with him, so that he could say: “Surely your goodness and love will follow me all the days of my life, and I will dwell in the house of the Lord forever.” (Verse 6) Very marvelous! It might be easy for us to say these things when we’re in good condition, but how far we can still believing it when the problems are being repeatedly hit us? 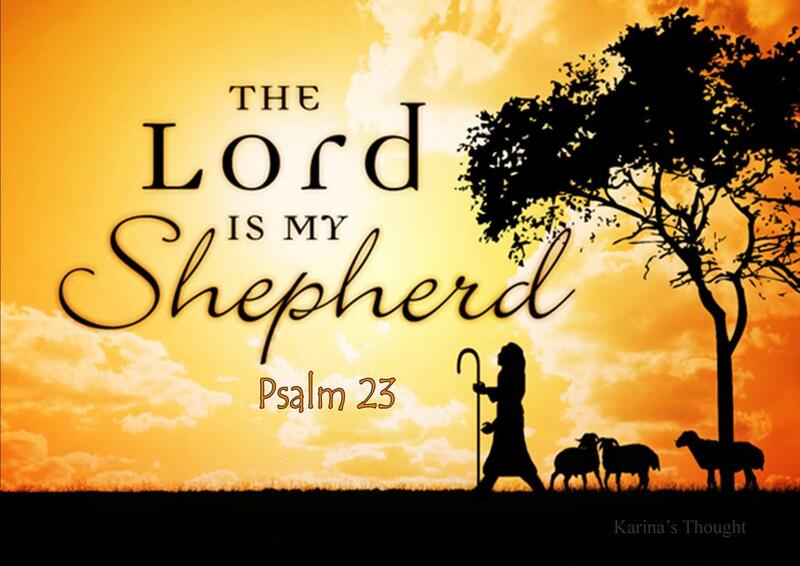 Jesus said: “I am the good shepherd. The good shepherd lays down his life for the sheep.” (John 10:11) Such was the figure of the Shepherd who always protects us as His sheep. Trouble could come over our lives, but God promises us to still have a life. Not only life but living in all its fullness. Not lack yet in fullness? Yes, right! Although the problems are present in our lives, God promises that His providence could give strength, give relief, protection, give hope, and that’s all He provides not only sufficient but abundantly. My manager was able to experience how God gave him strength in his difficult times, and he realized that there is no reason for him to be disappointed to God and blame Him. He certainly sad and loses but he also realized though he lost his beloved wife, he believes God still preserve his life and did not show a conclusion that God is not fair. He realized and believes that his wife had gone into the peaceful kingdom which full of joy, where there is no crying and no more suffering again as often we experience in this world. His wife has been in the eternal God’s providence in heaven. My lovely friends, when we have a situation full of suffering, could we continue to believe that we will never lack the strength? Can we believe that God’s presence will always give reassurance and relief in a heavy burden? When there are events that occur beyond our control, could we rely on unlimited God’s power or we are still busy hanging on our own strength or another human being who have limitation? In any difficult situation, remember that God never leaves us. He will never lose by anything. He said, “I am the good shepherd; I know my sheep and my sheep know me—just as the Father knows me and I know the Father—and I lay down my life for the sheep.” (John 10:14-15) These verses show us what a close and beautiful relationship between God as the shepherd and us as His sheep. If we truly comprehend the meaning of these verses and put in the bottom of our heart and minds, why do we have to worry with all the trials and suffering that might happen in our lives? “For with God nothing shall be impossible.” (Luke 1:37) There are no problems that He could not overcome. Believe that God will not remain silent when we really need his touch. Therefore, do not be discouraged, but always be thankful. Make our relationship with God still close and closer day by day, experience God’s presence and providence personally, until at the some point we can say with full confidence as David said, “THE LORD is my Shepherd, I shall not lack.” Amen. 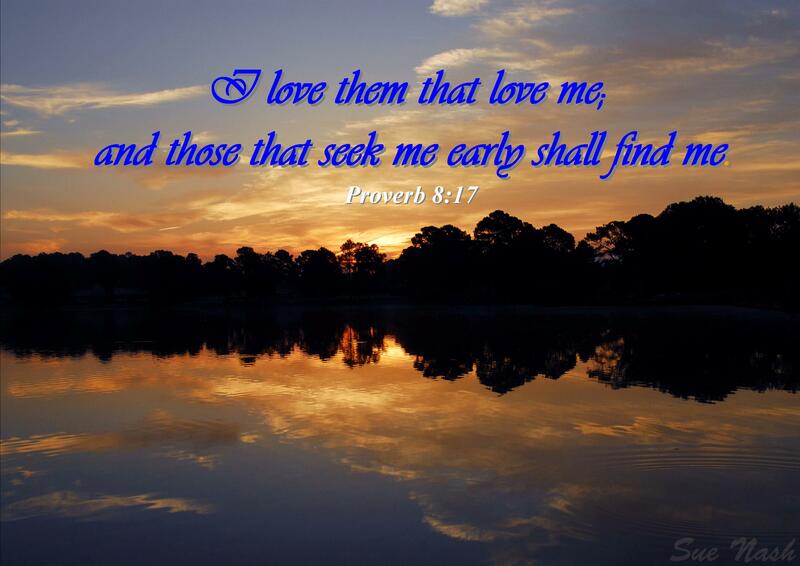 This post was inspired by blog post from my dear sweet sister in Christ Sue Nash who wrote a beautiful poem based on Proverb 8:17 “Before the sunrise – I will seek you “ But I am not truly wrote this post based on her poem. This is just another thought of its verse. The Holy Bible advises to us, “Never be lacking in zeal, but keep your spiritual fervor, serving the Lord.” (Romans 12:11) We have lost our first love for the Lord as happened in the Ephesians’ church.”… You have forsaken the love you had at first.”(Revelation 2:4) Without perseverance, anything we do will never bring maximum results. We all really longs that the promises of God fulfilled in our lives, but it would be difficult to be realized if we do not have perseverance. Perseverance in prayer and in doing that all God wants in our lives. So persistence is the most important element to get the success. Especially in this era, almost everyone wants everything instantly. Want to get success quickly, but do not want to work hard, want to succeed, but do not want to strive. How persistence can be formed? James said, “Consider it pure joy, my brothers and sisters, whenever you face trials of many kinds, because you know that the testing of your faith produces perseverance.” (James 1: 2-3) Through testing we can learn to persevere. That is why sometimes God allows problems happen in our lives in order that we have the perseverance. Persistence also can be formed through the practice. Persistence that does not happen in an instant but needs to be trained from the small matters. How we can persevere in the face of big problems, if we are not persistent facing a small problem. My dear lovely readers, how about us? How big our persistence? Do we want to be successful in all aspects of our lives? Start by seeking God’s wisdom perseveringly. Ponder the God’s word every day, do it and obey. For whoever finds wisdom, get a life and God will deign to us. “For those who find me find life and receive favor from the Lord.” (Proverb 8:35) Have we meditate and do the word of God with persistent so that we get the blessing and His love? There is an old story of faithful mother who had been praying for 28 years for her son to come to faith in Christ. Year after year her son was rebellious. He abused drugs, was in and out of jail, and showed no sign of ever knowing Christ. The days and years dragged on with absolutely no indication that there was anything different in the man’s life. Then one day, 28 years after his mother first prayed for him, this man, and this man came to saving faith in Christ. Today this man, Terry Williams, uses his testimony to help other prison inmates find their way to a relationship with the only one who can save: Jesus Christ! What if this mother had given up? What if she decided it was not important enough to keep praying each and every day? What a difference this mother made in hear steadfast prayer due to her undying love for her son. Today her son is making an external difference for other in prison. This was all due to prayer, even though she had to wait. This story shows how persistent a mother praying for her son. Not just persistence in prayer but also illustrates patience in waiting the answer from God. 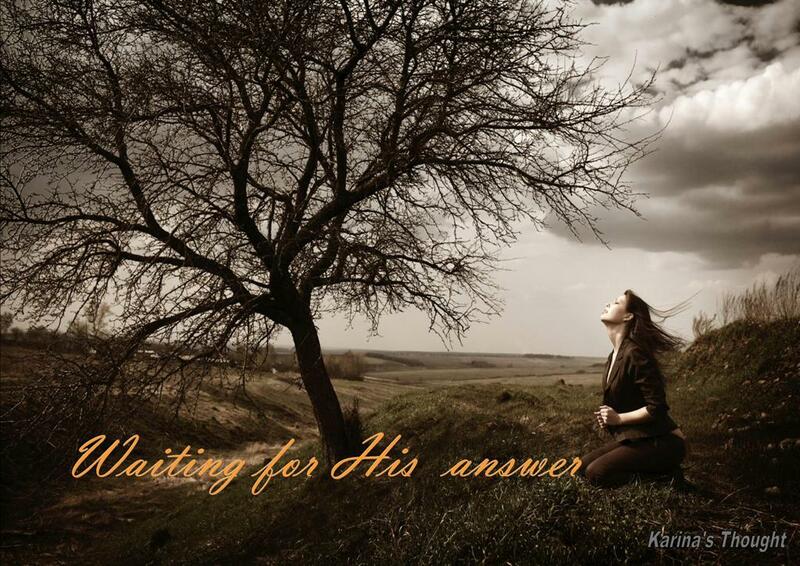 This evening I would like to talk about waiting for God’s answer of our prayer. This is often becomes a problem when we pray and waiting for the answer from God. When we talk about waiting for God’s answer it mean we talk about God’s timing. When we talk about God’s timing, we will be faced by something which is seemingly not clear and uncertain, will make us impatient, raised doubts in our heart, and finally we will draw conclusion that God not hear and answer our prayer. Actually, God expect us to wait patiently on his perfect timing. Let we dive into the some scriptures in the Bible. Let we see what they said. First, we look in Hebrews 10:36, “For you has need of patience, after you have done the will of God, you might receive the promise” This verse clearly said that if we have to patient and doing God’s will we will receive His promise. Next, let’s take a look to Psalm 37. This chapter is a great Psalm to read when we are seeking the desires of our heart with realization that it may take some time. My dear readers, maybe this time we’re struggling with severe problems and had been praying for so long but there is no answer from God and we begin to falter. Based on many story in the Bible and based on a bit my experience, this evening I encourage all of us to remember one thing that God actually hear any prayers we say even He already knows what we are going to pray before we pray. Every prayer with strong faith, humility, with a pure heart, according to His will and not oppose with God’s commandments will answered by God and whatever His answer, it is the best for us. Like the story of mother above, we just need persistence and patience. Remember our timetable is not God’s timetable. God will answer our prayer in His time. How long? Three weeks like Daniel? More than two years as I pray for my fiancé to open his heart to receive God as his personal savior? 25 years like Abraham waited to have a child? Or 28 years like that mother? We just don’t know. What we know is only continue to persevere and be patient, always rely on the God’s power and wisdom. Keep faith and do not waver. Truly understand God’s will and purpose. Always live in the Divine righteousness. Submit all control of our lives to God through the Holy Spirit and His Word. The answer of a prayer is a mystery that only God knows when that prayer would be answered. We do not have the ability to unveil the secrets of the Divine. We just know that:” He has made everything beautiful in its time. Also, he has put eternity into man’s heart, yet so that he cannot find out what God has done from the beginning to the end.” (Ecclesiastes 3:11) Amen. Today, in the middle of my busyness, my sister in Christ, Sue Nash gave me a surprise. 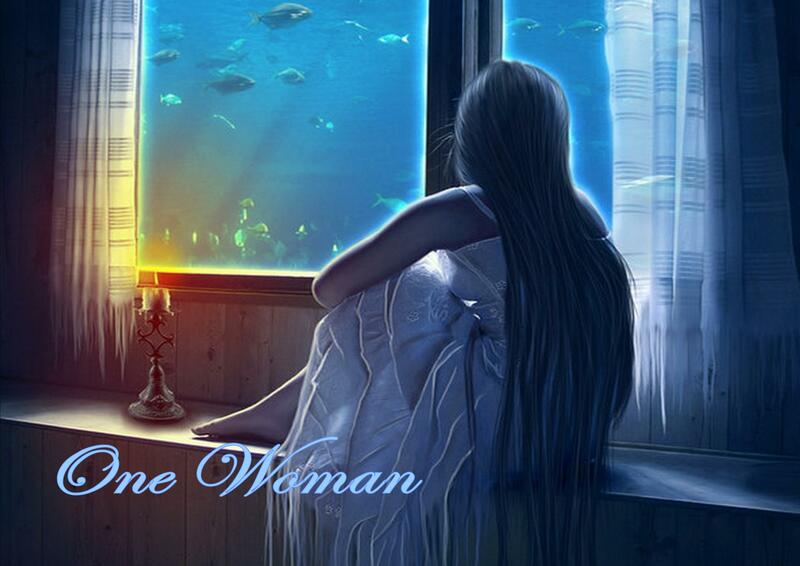 She wrote a poem based on my post “Woman of Faith” series. It is been honor for me and this evening I would like to share this spiritual and inspirational poem to all of my lovely reader. My sister Sue, Thank you very much for your kindness. Love you so much. To bear a child in her mistress’ place. For the son of promise, it wasn’t too late. To come before the king as he wished. To the childless wife and teased. For a son to dedicate as priest. To stay behind with those she knew. For Naomi’s God to be hers, too. To have a child at her age was a thrill. To serve their Guest all alone. For the one thing that mattered most. To see her Son crucified. For His disciples to come see that He’s alive.